Aer Lingus, Ireland’s largest airline, is one of the most popular ways to get to Dublin and beyond. Until the carrier joins with British Airways and Iberia in using Avios next year, it still requires a bit of savvy to book award flights. TPG Contributor Richard Kerr shows you how to book award travel on Aer Lingus utilizing a variety of partners. As the national carrier of Ireland (if you don’t count low-cost carrier Ryanair), Aer Lingus is always in high demand. The Emerald Isle continues to be one of the most desirable destinations for North American and European travelers due to its incredible scenery, history and vibrant culture. Today, I’ll go through the various options for booking Aer Lingus flights with points and miles. 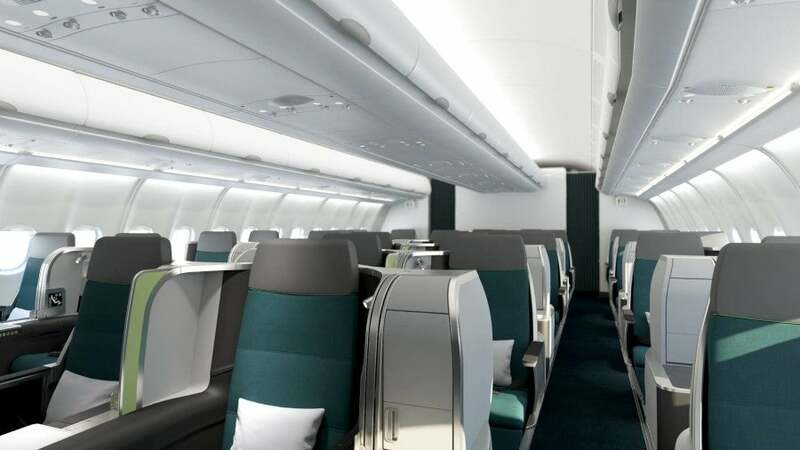 The new Aer Lingus business class makes for a relaxing flight to Europe. Aer Lingus currently flies nonstop to six North American destinations: Boston and New York (from both Shannon and Dublin), Chicago, Orlando, San Francisco, Toronto and Washington Dulles from Dublin. In 2016, Aer Lingus will begin service to Los Angeles, Newark and — most intriguingly — Hartford, CT. All long-hauls are flown with Airbus A330-200/300 aircraft, some of which have the new business class, and leased 757-200s. The old business class isn’t terrible, but I’d still recommend checking your flights carefully when booking. Truly a one-of-a-kind program, the current Gold Circle club is only open to “qualified” membership for those who have already traveled enough to earn 2,400 points in a 12-month period. The program has never been popular because of its convoluted rules, limited award availability and little chance of using the points on other airlines, as Aer Lingus is not (yet) a member of an alliance and has few partners. Enter the good news with IAG’s takeover of Aer Lingus. IAG owns British Airways and Iberia, both of which share the popular Avios loyalty program. Aer Lingus will join the Avios party in spring 2016 with a newly branded loyalty program named AerClub. Aer Lingus will also be rejoining the Oneworld Alliance, meaning redeeming flights on Aer Lingus should become easier. Few details are out about AerClub, but I’ll be keeping a close eye during the next few months when both the earning and award charts are released. Avios have been the long-time favorite currency for flying Aer Lingus due to the low costs and the lack of fuel surcharges added on award tickets to Ireland. The 25,000-Avios economy round-trip tickets from Boston to Shannon and Dublin are still here, but business-class prices have increased after April’s Executive Club devaluation. If you’d like to redeem Avios for an Aer Lingus flight, consider signing up for the Chase Sapphire Preferred, which offers 50,000 Ultimate Rewards points after you spend $4,000 in the first three months of account opening. Because British Airways is a 1:1 transfer partner of Chase, this one card can get you and your special someone from Boston to Ireland round-trip for $22.40 in taxes and fees! You can also transfer American Express Membership Rewards to British Airways (albeit now at a 1,000:800 ratio) or use the co-branded British Airways Visa Signature Card to earn Avios directly with every purchase. The downside to booking with Avios is that BritishAirways.com doesn’t show Aer Lingus award availability. You can check United.com or Qantas.com for availability and then call British Airways to book your ticket using Avios. British Airways’ call centers are notorious for long wait times, so I usually call the Singapore or Hong Kong Executive club number using a VoIP app to skip the wait. One advantage of Aer Lingus not currently belonging to an alliance is that you can use different programs from competing alliances to book free flights. Using Star Alliance member United’s miles, economy will cost 30,000 miles and business class will cost 70,000 miles one-way from any North American destination to Ireland. Fuel surcharges are nonexistent and taxes and fees will usually cost you $5.60 per person each way. Aer Lingus flights from North America to Dublin or Shannon cost 30,000 miles one-way in economy. It’s easy to book Aer Lingus with United miles, as United.com shows availability for Aer Lingus-operated flights. Another advantage to using United miles is booking nonstop flights from the West Coast to Ireland. Unlike British Airways, United won’t charge you any additional miles because the flight is longer. For example, business from San Francisco to Dublin with the new BA award chart is now 75,000 miles each way, whereas United is still 70,000 miles. This option is often overlooked, mainly because Aer Lingus isn’t part of the Oneworld Alliance with Qantas. The East Coast routes actually provide better value than booking with United. The number of points Qantas charges for the rest of the routes compared to United is worse in economy but better on some routes in business. Compare the distance chart of the Aer Lingus routes to North America (above) with the Qantas award chart (below) to find out how many Qantas points you’d need for a one-way award ticket. Qantas distance-based award chart for Aer Lingus flights. The routes to Ireland from Boston, New York and DC will cost a reasonable 28,000 miles in economy (2,000 less than United charges) and 53,000 miles in business (17,000 less than United). The West Coast routes, including the new LAX-DUB route starting next year, cost more than booking with United and BA Avios. Qantas was recently added as a Citi ThankYou Point transfer partner, meaning Citi Prestige and Citi Premier cardholders can take advantage of some of the lower points required when using Qantas to book Aer Lingus instead of United or British Airways. As mentioned above, you can use Qantas.com to search for award availability by completing a classic award search and looking for the Shamrock next to the flight number. Use Qantas.com to find availability and either book using Qantas Points or call BA to book over the phone. The answer comes down to which route you’re flying. You should compare the data presented above from British Airways, United and Qantas to choose the program which charges the least out of the points you have. The great news is that you can use Chase Ultimate Rewards, American Express Membership Rewards and Citi ThankYou points to book Aer Lingus because of all the transfer partnerships. 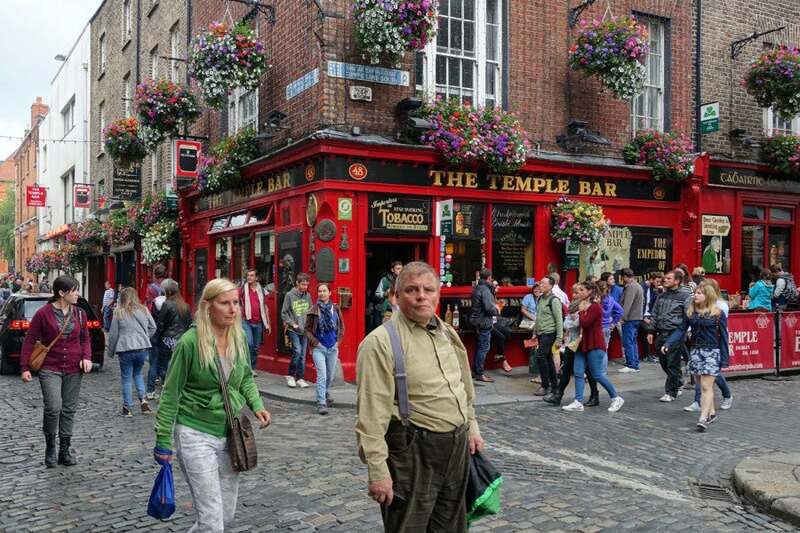 Don’t miss a visit to Temple Bar on your trip to Ireland! Given the popularity of flying Aer Lingus from North America, availability will be your largest hurdle. Economy seats are fairly easy to spot on United.com and Qantas.com, but business class is a different story. My quick searches of most routes showed business award seats to be elusive. There have been a few random times during the past couple of years when business seats become widely available, so for now we’ll have to count on luck. But since flights from the East Coast to Ireland can sometimes be less than six hours, I am willing to “rough it” if it’s only costing me 12,500 Avios. What’s your preferred way to book an award ticket on Aer Lingus?